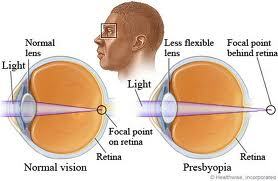 Presbyopia is the gradual inability of the eye to focus at near objects with age. This is part of the normal aging process, even if you had perfect eyesight before that. You will find that in order to read clearly, the reading material has to be placed further and further away. This is usually noticed from the age of 40 onwards. However, if you have myopia or shortsightedness, you may still retain some ability to read fine print without the need for reading glasses. Presbyopia is not the same as hyperopia or farsightedness even though near vision is reduced in both situations. 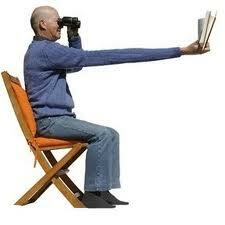 In presbyopia, although reading vision gradually reduces with age, the distance vision remains unchanged. This is due to the aging change that occurs in the natural lens and the ciliary muscles that are attached to it. In contrast, hyperopia is not due to the aging process. It is usually due to the eyeball being smaller and shorter than average. If you have hyperopia, you will require corrective lenses for near (and sometimes distance) vision from young. As the lens ages, it becomes less elastic and loses its ability to change shape sufficiently to focus light from near objects onto the retina. In other words, the lens loses its ability to accommodate. This causes the light rays to be focused behind the retina instead of on it. HOW CAN PRESBYOPIA BE TREATED? - Bifocal glasses: These are lenses with 2 different strengths. The top portion is for distance viewing, while the stronger bottom portion is for close work. There is a visible line that separates the 2 lenses. Trifocal glasses have 3 different strengths with a middle portion for intermediate vision. - Progressive addition / varifocal glasses: The strength in these glasses gradually increase from the top distance portion to the bottom near portion. There is no visible line that separates the lenses. The advantages of progressive addition lenses include the ability to see intermediate distances and seamless transition from distance to near vision. However, the disadvantages include the more expensive price tag and smaller field of view. - Monovision contact lenses: In monovision, one eye (usually the dominant eye) wears the distance prescription, while the other wears the near prescription. For some people, this is a convenient and effective way of treating presbyopia. However, this option is not suited to everyone because in general, your eyes are used to working together. Wearing of monovision contact lenses may cause headache, eye strain and loss of stereopsis. 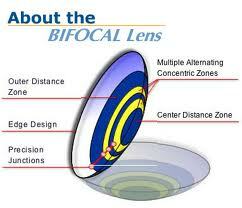 - Bifocal / multifocal contact lenses are now also available for presbyopia. They are essentially similar to progressive addition glasses, except that these are worn as contact lenses rather than as spectacles. Conductive keratoplasty: Conductive keratoplasty involves reshaping the cornea so that light entering the eye can be focused uniformly onto the retina. Unlike laser refractive surgery, conductive keratoplasty reshapes the cornea with low energy radio waves. The radio waves are applied to specific spots around the outer cornea in a circle. By shrinking the corneal tissue, the cornea becomes steeper. This enables light to be focused onto the retina during close up work. However, the treatment effect may not be sufficient if your presbyopia worsens. If this happens, then at least you will have good intermediate vision, such as for watching television. It is likely that eventually, you will still end up needing reading glasses, although conductive keratoplasty may delay this for several years. 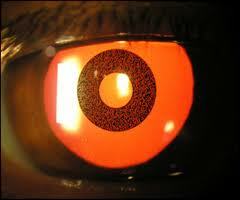 Corneal inlays are biocompatible materials that are placed within the body the cornea (front window of the eye). The pinhole effect from the inlay allows light from near and far objects to be focused onto the retina. 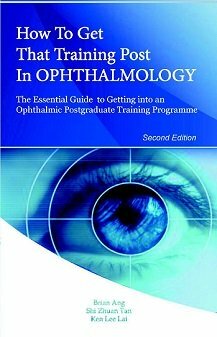 The result is good reading vision without compromising intermediate and distant vision. Corneal inlay insertion involves creating and lifting a flap from the cornea, inserting the inlay, and then replacing the flap to keep the inlay in place. The operation itself takes up to 20 minutes to perform. Only anesthetic eye drops are needed for the procedure. No sutures are required. Corneal inlay implantation differs from cataract surgery in that the inlay is not placed inside the eyeball, but rather within the corneal tissue itself. The inlay remains in the cornea permanently and does not need regular maintenance or removal. However, it can be easily removed or repositioned surgically if needed. Cataract surgery: Cataract surgery is the only proven effective treatment for cataract. After the cataract is removed, an intraocular lens is implanted into the capsular bag to replace the natural lens and focus light onto the retina. To treat the cataract and presbyopia at the same time, one of two types of intraocular lenses (either multifocal or accommodating) is implanted in the eye to enable focusing for both distance and close work. Complementary therapies range from eye exercises to acupuncture to herbal remedies. Most of these treatments help by alleviating the symptoms of eye strain from untreated refractive error rather than permanently curing your presbyopia.